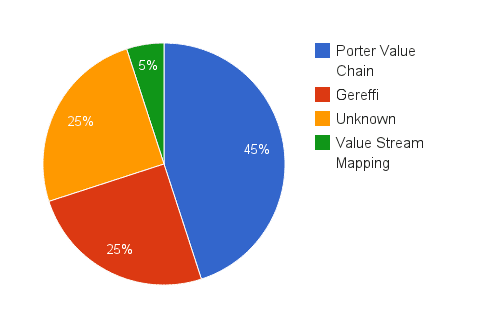 What is value chain analysis and how to use it? This article will show you the definition, model, and the example. "It can be defined as a strategic planning tool and it's used to analyze the value chain of the focal company. Value chain is how internal functions create value for customers. Value system is the way each value chain is structured and it spans across multiple companies"
What is the Value Chain Model? 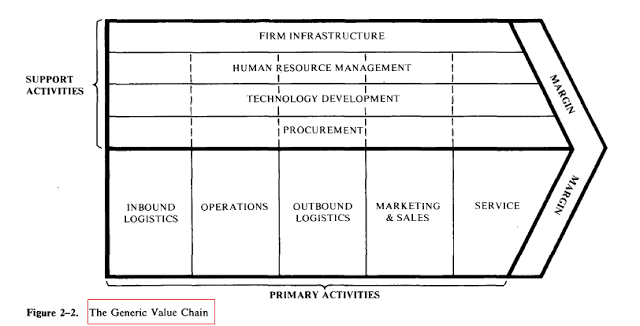 Value Chain Model is mentioned extensively in the first half of the book "Competitive Advantage" in 1985 by Michael E. Porter. The Value Chain Model represents various functions under "one" company and how they should work together to create "Competitive Advantage". Another related concept is "Value System", it's simply how each value chain (company) is connected with each other. What is NOT Value Chain Analysis? The results are surprisingly shocking! Only 9 out of 20 articles cite Porter as the source of the concept (only 3 of them explain the concept appropriately, the rest of them do a value system analysis using the unknown methodology). Five articles (mainly from an economic perspective) mistakenly use the term to present an unrelated concept called "Global Commodity Chain" by Gereffi, G. and Korzeniewicz, G. (Ed) (1994) Commodity Chains and Global Capitalism. The surprise doesn't end there, 5 articles present the concept without citing any source, it seems they invented their own methodology. One paper cites many lean manufacturing articles instead of Porter's so conclusion can be drawn that it's Value Stream Mapping. According to a literature review, articles related to this concept are extremely unreliable. Then, Original Porter's Competitive Advantage is used as a source. 2. Capturing Cost Data: Estimate costs and assign them to various activities in your value chain. Then, select stronger competitors and determine how they allocate costs to each activity and why. According to Porter, the cost analysis part doesn't need to be very precise, just the estimate is OK. But, a company needs to compare its cost profile against its competitors to reveal the competitor's strategy.